Originating in the vast green lands of Scotland more than five centuries ago, golf has gradually conquered a top place among people’s favorite sports. With more than 70 million golfers in the world, 26 million of which in the USA alone and more than 15 million in Europe, golf has become not only popular, but extremely profitable industry. Viewed as an elite pastime years ago, the game now covers not only variety of social backgrounds, but more important variety of ages too. To be a one’s entire life game is probably one of the biggest advantages of this sport. And just recently golf has finally found its best venue in the green fields of the Bulgarian coast. The country has been considered one of the top emerging tourist markets and with a number of golf developments already on the run, its leading position in the holiday field will be strengthened even further. Only couple years ago, Bulgaria has been considered a beach holiday destination, however with number of golf courses undergoing and in planning, this is soon to be changed. This will certainly have great impact on the tourism industry, but also on the economy in general. Property markets have started to feel this impact and prices and interest in properties along the golf courses have marked a steady rise. Bulgarian projects in the golf are estimated at more than 500 million EUR, some of which presented on the edition of the International Golf Travel Market (IGTM). Some of the key issues highlighted were the constantly increasing interest to Bulgaria as an investment and travel location with stable development of golf tourism. The engagement of world class designers as Gary Player, Ian Woosnam & Jack Nicklaus in the development of the new golf resorts will make definitely Bulgaria a preferred European golf destination. Three of those projects are located in the yet unspoiled beautiful coastal area, north of Varna city. Fascinating locations, right next to the edge of cliffs, going down into the waves of the Black Sea, excellent climate with plenty of sunshine and temperatures between 24 and 30 degrees C between late April till October and welcoming attitude, those courses will easily become a favourite ones. All three are 18-hole courses, planned and realized in accordance with all modern trends in the golf course’s architecture and landscapes. Situated high on top of cliffs only divided from the sea by a small strip of the land the site benefits from spectacular views along the coast in either direction. Having predominantly been used for agriculture in the past the site lacks much feature although there is great scope for the movement required to create an interesting Golf Course and Resort. Detailed design work has been done on the 18 hole, located just outside of the small resort town of Balchik, 40 minutes from Varna city and the International airport.This prject is Ryder Cup Captain Ian Woosnam's. 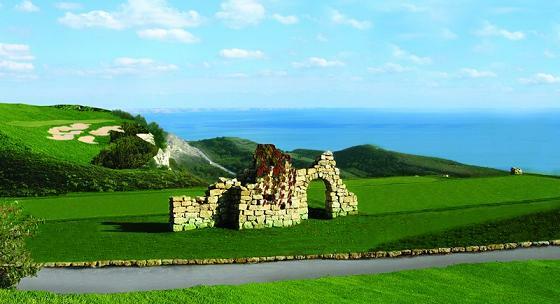 Thracian Cliffs Golf course is located on the northern Black Sea Coast of Bulgaria. According to Gary Player, it is destined to become ONE OF THE WORLD’S TOP 3 GOLF COURSES. The 18-hole Gary Player Golf Course forms the core of the development that was designed prior to situating the real estate components within the resort. This fact permitted the famous and talanted designer the optimum positioning of the eighteen holes directly along the cliffs on an undulating terrain without being compromised by the location of buildings. Carefully selected locations of tees and greens on 164 hectares of wild, scenic Black Sea cliff terrain, spanning 4.5 kilometres along the coast, bestow a truly exhilarating golfing experience. The site of Thracian Cliffs Golf & Spa Resort, which extends to the lip of a 150 meter high seaside cliff, is marked by a plateau surface and offers a spectacular elevated view of the Black Sea. The rough topography of the sea level Thracian Cliffs golf course will create a nice contrast and will drive a diverse design approach. The golf course ranges through 145 tranquil, south facing hectares. Vastness and beauty will accompany you all the way to the 18th hole. The inspiration for the architecture came from the local coastal architecture of materials such as the local stone, which is quite light in colour, timber as well as rendered walls and mottled ‘old style’ pan-tile roofs should be used. It is intended that the window and door frames as well as the external shuttering will all be from local renewable timber sources. BlackSeaRama won Best Bulgarian Development at the Bentley International Property Awards 2005, the leading industry award and regarded as the industry's Oscars, recognizing the best in the overseas property industry. BlackSeaRama is a Gary Player Signature championship golf course and villa resort in Bulgaria with modern, luxurious accommodation and breathtaking sea views offered to those seeking a premier holiday retreat. This exclusive gated seaside community features a world class 18 holes signature golf course designed by the legendary Gary Player and unbelievable views of Bulgaria’s Black Sea coast. 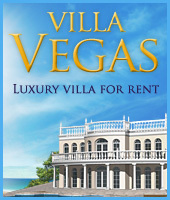 The luxurious villas and bungalows are half the price of those found in comparable developments in Spain and Portugal and, as an investment opportunity, Bulgaria offers one of the most rapidly appreciating real estate markets in the world. BlackSeaRama is an ideally accessible area for holiday or second homes. Varna international airport is just 30 minutes away and the City itself has extensive shopping facilities, theatres, restaurants, bars and many other tourist attractions. The historic fishing port of Balchik and the renowned Golden Sands resort are also within easy access offering a whole range of facilities for holidaymakers apart from the golfing fraternity.